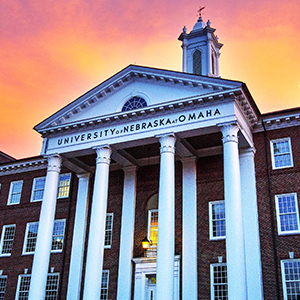 An interdisciplinary team of UNO faculty members from computer science, mathematics, and education has been awarded a National Science Foundation grant ($299,375) for developing, implementing and assessing an alternative way for students to learn quantitative, symbolic, and computational reasoning, a way that will engage students in an appreciation for the beauty of mathematical thinking. Central to the project is a software program named Bricklayer developed by Dr. Victor Winter, Professor of Computer Science, and Co-PI for the grant. According to the grant proposal, Bricklayer is "an open-source educational ecosystem that uses coding, mathematics, and art to teach computational, quantitative, and visual-spatial skills. Bricklayer provides an example-rich and problem-dense domain in which students learn to write programs in the functional programming language SML. When executed, Bricklayer programs can produce LEGO® artifacts, Minecraft artifacts, and artifacts suitable for 3D printing. Among such educational ecosystems, Bricklayer is unique in the strength of its integration of math, art, and computer science concepts into one learning environment." Dr. Betty Love, Professor of Mathematics, and PI for the grant explains the inspiration for the project, "Across the nation there is growing concern that remedial math courses (intermediate algebra, in particular) present an unjustifiable barrier to higher education for non-STEM majors. This barrier is especially pronounced for underrepresented or disadvantaged student populations. Universities are beginning to respond to this issue. For example, California State University officials have recently issued an executive order directing their campuses to (1) eliminate this type of math requirement for all non-STEM majors, and (2) offer appropriate math alternatives. 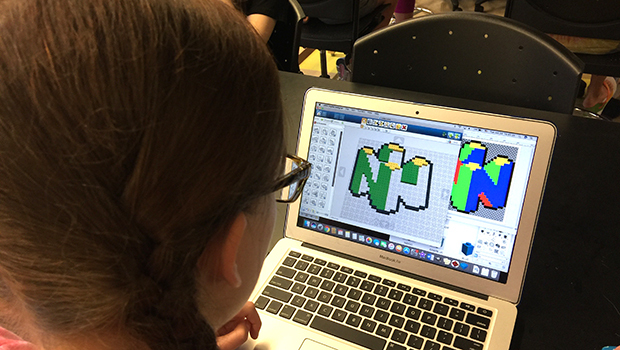 Our proposed Bricklayer-based gen-ed course is such an alternative, and will provide students with a foundation in both mathematical and computation thinking." According to the grant proposal, "Bricklayer is designed in accordance with a “low-threshold infinite-ceiling” philosophy in order to afford access to students at any level while providing a platform for even experienced programmers to be challenged." As Love details here, the UNO team has been very busy proving the program's worth at various levels. "Bricklayer-based courses have been taught at UNO to freshmen in the College of IS&T and to sophomores majoring in Math. Outside of UNO, Bricklayer has been taught in around 75 Elementary and Middle Schools, albeit mostly in gifted programs where there is curriculum flexibility. We conducted research in several local elementary schools over the past academic year to determine the extent to which learning Bricklayer improves math skills. We are just starting to analyze this data." 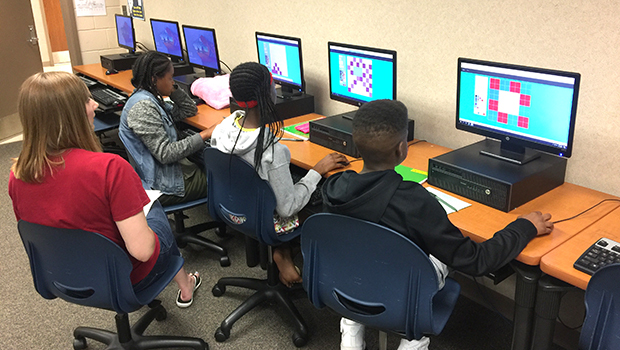 The photos included with this story are from Love's summer class, "MTCH 8040, a 'using technology to teach math' course for in-service teachers." 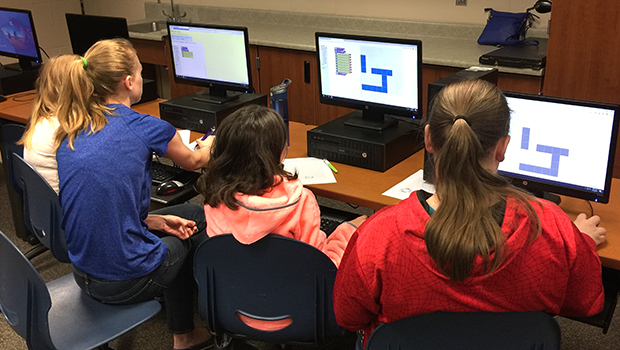 She explains, "I taught these teachers how to code in Bricklayer and the course culminated in a week-long service-learning experience in which my students taught K-12 kids how to use Bricklayer. One group of my students spent mornings with Dawn McKain’s summer-school students at Alice Buffett Middle School. The other group worked with kids from the community who came to UNO for the 'camp.' This is the second time I’ve taught the course like this. Both times it was a great experience for all!" She adds, "We have published several peer-reviewed articles about our Bricklayer work, given numerous presentations (locally, nationally, and internationally; many including local teachers as co-authors), and provided numerous free training workshops for teachers." A pilot course enrolling 40 UNO students will be offered spring 2018 and a second pilot enrolling 160 students will be offered Fall 2018. 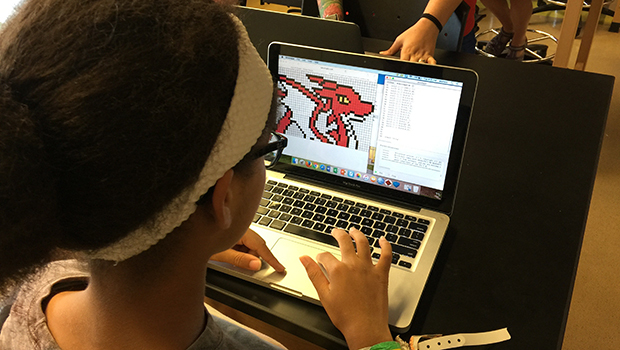 Do students express more interest in mathematics and STEM after participating in the STEM 1310: Bricklayer course? Do students who take the STEM 1310: Bricklayer course plan to continue participating in STEM by taking further STEM courses? Does participating in the STEM 1310: Bricklayer course increase students’ confidence and self-efficacy with mathematics and STEM? Other Co-PIs are Dr. Michell Friend, Assistant Professor of Education, and Dr. Michael Matthews, Associate Professor of Mathematics. Dr. Neal Grandgenett, Haddix Community Chair of STEM Education, will assist the external evaluator from RMC Research Corporation in retrieving institutional data and ensuring that the project is data driven and responsive to requests from the evaluator.